At an energy psychology conference last year, an attendee at my lecture came up to me afterwards to ask whether a random number generator might detect the beneficial influence of her favored intervention – therapeutic harp music. 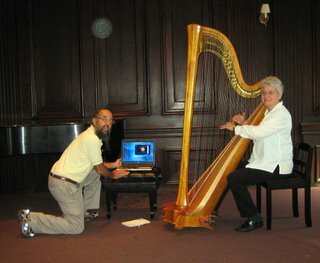 It turns out that she’s the editor of a national journal that documents the clinical benefits of listening to harp music (The Harp Therapy Journal) and Sarajane Williams was persistent enough that her long expressed wishes to have a laptop recording RNG data alongside her harp finally came true last week at the Boston Conservatory of Music. She was there to film several demonstrations for her own documentary “The Healing Harp”, and we did one set of RNG measurements while she was plucking away. To the listener, it was easy to be transported to a place of comfort and relaxation (and hopefully of non-random computer output). My son David and I also got to witness a demonstration of two reconstructed classical Greek instruments, the lyre and the kithera. Both had been made of natural materials by Chris Pantazelos, a local luthier, based on the images painted on ancient Greek urns and vases he’s seen at museums around the world. It was musical time travel. The harp data hasn’t been analyzed yet, but here’s the link to Sarajane’s website: www.harptherapy.com.